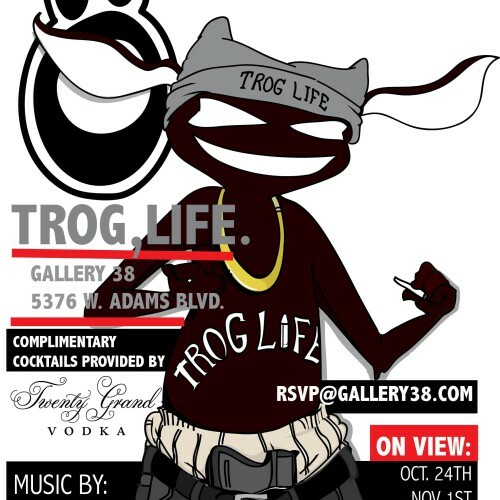 TROG LIFE, an art exhibit by Jaq Dutch on view October 24th – November 1st. #TROGLIFE is the 7th Solo Exhibition from Los Angeles artist, Jaq Dutch aka “Dutchie”. This exhibition will solely feature some of her more popular creations called TROGS. These little hellions were created 3 years ago, as last minute additions to another art piece; since then they’ve taken a life of their very own. The exhibit will be held at Gallery 38 in West Adams at 5376 W. Adams Blvd. Opening night is Saturday, October 24th, 2015 from 7pm to 11pm. Music will be provided by DJ El Ray with themed cocktails from Twenty Grand Vodka. Come spend a night with the TROGS, and see what the #TROGLIFE is all about. It’s certainly sure to be one to remember. JaQ Dutch also known as “Dutchie” grew up in a family of artists and started displaying interest in art at a very young age. She turned talent in to more than just a hobby when she started her creative company, GUD GUERRILLA in 2010. GUD GUERRILLA serves as a creative hub for the many skills she has to present as a curator and multimedia artist. Jaq’s art encompasses a wide range of mediums, including, drawing, painting, graphic design, animation, and murals. JaQ’s body of work is generally described as imaginative, lowbrow, dark fantasy, with surreal imagery and a unique sense of visual balance. Heavily influenced by the “Masters of Magic” Jim Henson, Salvador Dali, Robt. Williams, Brian Froud, Ralph Bakshi, and Disney Animated Classics. illustrations. Dutchie’s eclectic style has been featured on various online publications, as well as album covers, in films, commercials, restaurants and in galleries, all over Los Angeles, including Lab Art Gallery. Dutch is currently working on her 7th solo show curated by GUD GUERRILLA, entitled #TROGLIFE.